Officially, we now have a mobile app! The Nokia OVI store now carries the "GIS in Education" application for your mobile. You can check it out here. Download it for free (for Nokia users, for now) and tell your friends about it. 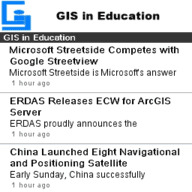 The "GIS in Education" mobile app will update you of the latest in Educationgis.com. If you don't have the time to visit this site everyday, download the free app and we'll deliver the news directly to your Nokia smartphone. Here is the link to the app again. Ovi Store is intended to offer customers content that is compatible with their mobile devices and relevant to their tastes and locations. Customers can share recommendations with their friends, see what they are downloading, and let them see items of interest. The main goal of this site is to provide the Geospatial technology users and professionals, specifically targeting students and academicians, with the latest developments affecting the GIS and Remote Sensing fields.